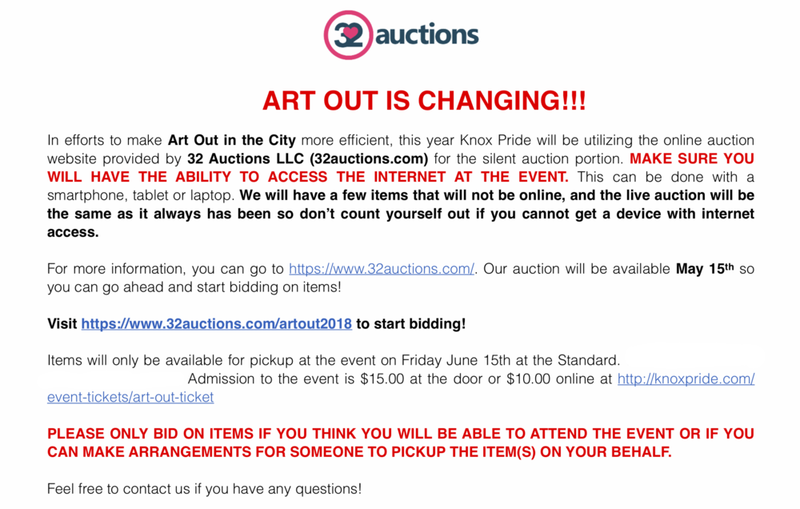 Can you believe that we are celebrating 13 years of Knox Pride? We are preparing to kick off a month long of events starting with Art Out In The City. We have over 100 amazing pieces of orginal art as well as varioius products and services donated by our amazing supporters. There is a $15 cover at door, which goes to help keep our Pridefest FREE. With that donation you'll get to feast your eyes on some amazing art, have some delicious catered food & all of the beer and wine you'd like. Now that's what we call a deal! (Please don't drink and drive) 18+ to enter, 21+ to drink. Tickets available the night of the event. Art out is fancier than ever. See the online auction here.